Kingston Brass Chrome 8-inch Centerset Kitchen Faucet With Side Sprayer KS1271PL: This 8-inch Center Kitchen Faucet With Side Sprayer is built to last. The highest quality standards are used to precision manufacturer a top of the line product. Important features of this BRAND NEW Fixture: Complete Item! Everything necessary for installation is included. 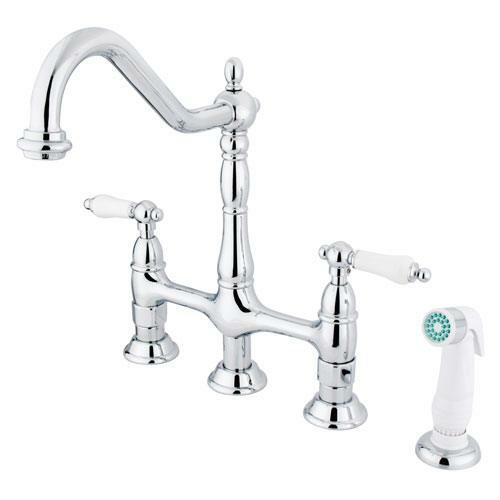 - White Porcelain Lever Handle - Matching Accessories Available - Easy to Install - Installation instructions included - 8-inch Center Kitchen Faucet With Side Sprayer - The Heritage theme brings a timeless traditional design with graceful, yet attractive round curves and Victorian style spouts. This double handle kitchen faucet includes a 8-inch centerset setup with a 360-degree turn swivel hook spout. The handle moves in a 1/4-turn rotation for water volume control with a 2.2 GPM@60 PSI max rate. Fabricated in solid brass for durability and reliance, we also provide an assortment of different finishes for stain, scratch and chipping resistance. White sprayer included. - Plastic Sprayer Included - 1/4 Turn Ceramic Disk Cartridge - Porcelain Lever Handle - 8 1/2-inch Spout Projection with a 9-7/8-inch spout clearance - 4 Hole Installation - Chrome premier finish designed to resist fading and tarnishing. This fixture is manufactured by Kingston Brass and is part of their Heritage collection.